DNC Chairman, Tom Perez appeared on MSNBC in a Monday night interview with Joy-Ann Reid. 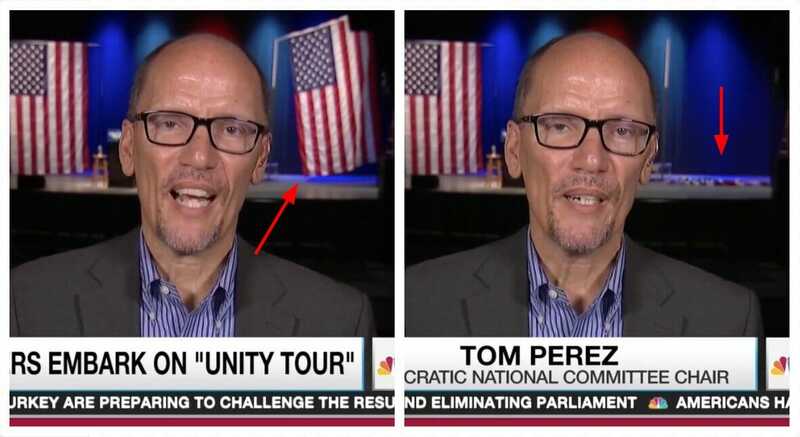 As he said ‘Secretary Clinton’, the American flag hanging behind him fell to the ground. This just isn’t Perez’s day! He was booed earlier in the evening. TGP reported that the Socialist crowd cheered loudly for Bernie… But when Tom Perez was mentioned they crowd booed loudly. The DNC staffers were cleaning the stage after their ‘Come Back, Fight Together’ tour stop in Maine. Hillary Clinton’s name when mentioned makes true patriots recoil and in this instance even the American flag knows she’s the enemy to the United States. Actually, the entire Democrat party is the enemy to the Republic. I thank God everyday that Hillary did not win the election!